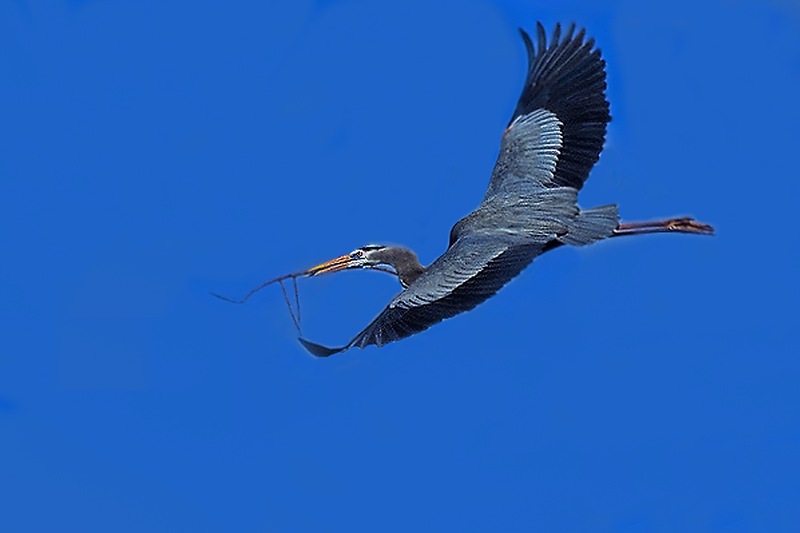 “Blue heron,” was the first thing he said, and he pointed to a patch of sky to my left. This he had to say twice, as his first attempt was cancelled out by the ear buds I wear whenever I attend this path –– this valiant oasis beneath a freeway overpass, dividing a pair of arsenic infected wetlands. (I’ve often wished the trail’s arsenic warning signs were composed in Duck as well as English. Nobody seems to give a crap about the ducklings that like to frolic in the stuff.) By the time I looked up, the heron had passed from sight. Fortunately, the first was followed by a second, this one flying lower than its counterpart. Herons are interesting creatures. If you don’t know birds (I don’t), you probably could not accurately describe a blue heron, but when you see one, you somehow know by instinct what it is. I watched the second heron glide, its long beak extended like a sword and its wings with finger-like feathers flapping just twice before it disappeared beyond a tangle of leafless trees. The bird was like soaring breath –– an excuse to stop and wonder about the way of animals and trees and all of us who tend to, at best, ignore them. At worst, we destroy them. This particular blue heron ushered in a wandering nature lover named Scott. “What ya smokin?” he asked me. I looked down at the smoldering stick in my left hand. “Four Kicks,” I answered. His question about my cigar preference was where our conversation found traction, a conversation that would stretch out nearly an hour, which was good with me. It was a day for such conversations, a blue heron day. Over the hour, Scott described the highlights of his life. He’d enjoyed much success as an automobile salesman when he was younger, but he got burned out on that gig years ago. He was married once, but things fell apart when his wife succumbed to prescription drug addiction. He has no kids. He did some traveling, back when he made enough money selling cars to do so. He trucked through much of Latin America, nearly dying of dehydration in the process, and he still describes the trip as the time of his life. He vacationed in Hawaii once. “If you go, don’t bring a woman,” he said of the islands. I didn’t ask him what he meant by that. He kept circling back to talk of his dad, whom I know he loves very much, because whenever he spoke of him, his eyes grew soft. His dad is in his late eighties and in a nearby senior facility. He’s not doing well. The entire time he spoke, there was a resident cheer in Scott’s voice, but it was tempered with the weight of worry. Perhaps it was worry about where he is in life, whether he’s done enough. Whether he is successful enough. He has a brother who likes to remind him of all the stuff he should be doing. He should be working more. He should be driving a better car. He should own his own home. He should be more like his brother, in other words. He said this several times during the hour –– the “no regrets” part. I found myself wondering if he sought confirmation from me over this. I could almost hear him asking a question in between those words. Should I? Should I have regrets? I decided to answer his unspoken question with an answer so subtle, only a guy like Scott would likely catch it. As we parted ways, he thanked me for listening to him, and I told him I was glad to do so. When I shook his hand, I caught sight of one blue heron, circling low over the wetland. Great post for so many reasons on so many levels! Thank you! Great piece. Loved the part about warnings for ducks. i have a brother like that…. There’s a lot of people like that around, right? I guess we can all be that person, in certain circumstances.